CANTON, MA (March 27, 2014) – With spring finally here, one of the season’s most fun and iconic sweet treats has flown into Dunkin’ Donuts and landed on the brand’s beloved donuts. Dunkin’ Donuts, America’s all-day, everyday stop for coffee and baked goods, today unveiled new PEEPS® Donuts, its first-ever donuts topped with a real PEEPS® Marshmallow Chick. 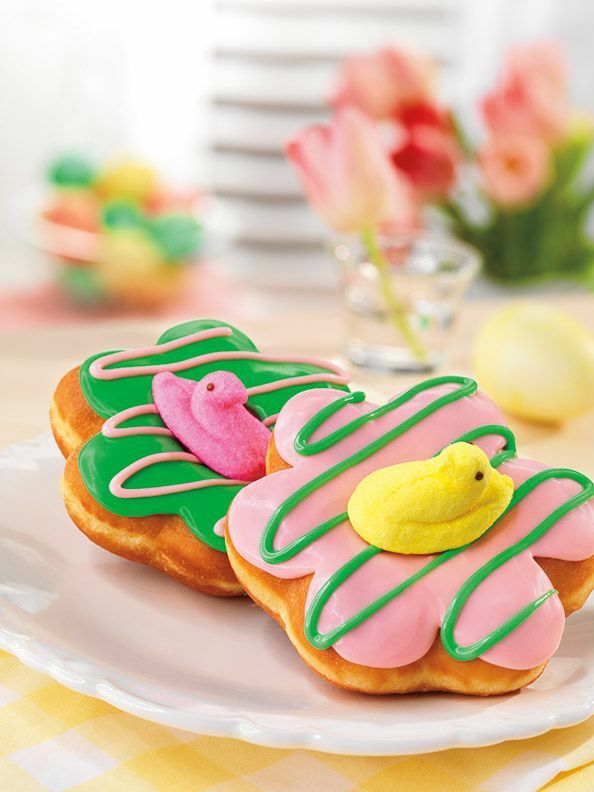 Perfect for spring and the Easter holiday, Dunkin’ Donuts’ PEEPS® Donuts are shaped like flowers, decorated with pastel pink or green icing and topped with a pink or yellow PEEPS® Marshmallow Chick. The new PEEPS® Donuts will be available for a limited time at participating Dunkin’ Donuts restaurants nationwide beginning Monday, March 31. For more than 60 years, Dunkin' Donuts has been a leader in the donut category, selling 2.5 billion donuts and MUNCHKINS® donut hole treats annually. Within the United States, Dunkin’ Donuts offers more than 70 varieties of donuts, including beloved flavors such as Boston Kreme, Glazed and Chocolate Frosted. To learn more about Dunkin’ Donuts, visit www.DunkinDonuts.com or follow us on Facebook (www.facebook.com/DunkinDonuts) and Twitter (www.twitter.com/DunkinDonuts). PEEPS® candies are an iconic marshmallow treat enjoyed throughout the year at special seasonal and holiday occasions. PEEPS® fans can find the marshmallow treats at their favorite retailer and a variety of other branded merchandise and apparel through www.peepsandcompany.com or at any of three PEEPS & COMPANY® retail locations. PEEPS® fans can also visit www.marshmallowpeeps.com and www.facebook.com/PEEPSBrand to stay up-to-date on PEEPS® news and find delicious recipes and fun craft ideas to help them express their PEEPSONALITY®. PEEPS®, a fan favorite since 1953, are manufactured by Just Born Quality Confections, a privately owned company founded in 1923 and headquartered in Bethlehem, PA, Just Born manufactures PEEPS®, HOT TAMALES®, MIKE AND IKE® and GOLDENBERG'S® PEANUT CHEWS® Brand Candies. All Just Born candies are made in the U.S.A.